Apps, suites, and examples for Backbone.js test development. This site provides materials and resources for developing and testing Backbone.js web applications. 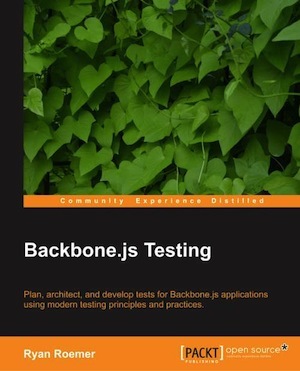 All of the application and test examples for the book Backbone.js Testing can be found here, grouped by chapter. We also provide a reference Backbone.js application - Notes - for creating and viewing notes, which we use throughout the examples in the book. We write a test infrastructure built on the following (fantastic) test libraries. The source code for everything is available from the project's GitHub repository. If you find any errors or issues in content or code, please file a bug report and we'll fix things up in short order. For those interested in extending our testing examples or helping out, please see our contribution and development guide. Backbone.js Testing by Ryan Roemer walks through the fundamentals of test-driven development for Backbone.js applications. All of the code samples are directly used in the book - it is essentially your narrative guide to this repository. Ryan and the team at Formidable Labs assist developers, from startups to Fortune 500 companies, with all aspects of Backbone.js web application and test development. At Formidable, we lead high-impact training sessions, build out some of the world's largest Backbone.js applications, and help get new projects of any size off the ground. Once you finish Backbone.js Testing, please reach out to us -- we'd love to accelerate your Backbone.js development and education. See the Chai installation notes for more compatibility information. Note that the Chai should object prototype extension is not compatible with IE 9 and lower. Notes is a simple personal note manager, written in Backbone.js. We provide two versions - a "quick and easy" localStorage based application that works in your browser with no additional setup, and a "classic" application with a full REST backend. The Notes application home page lists existing notes (by creation date), and provides a form field to create a new note with a title. 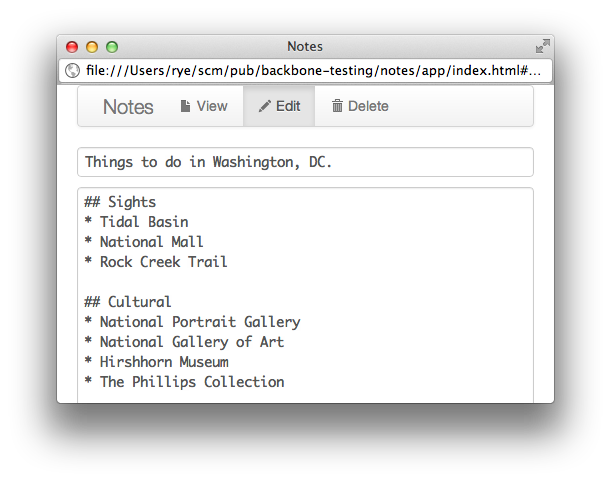 A filter field is available in the menu bar to limit the list of displayed notes by title. Clicking on the edit icon brings us to the single note view, with a simple form editor for the title and text body fields of the note. The body of a note is written using Markdown formatting. Clicking on the view menu tab switches us to the viewing pane, which renders the note's Markdown and produces our displayed note. The Notes application is written using Bootstrap's responsive libraries and should render fine on mobile devices, tablets, and pretty much anything else. App demo: Online demo for you to try out. Because the app saves to local storage, your notes will be preserved across browser sessions (for the same browser). Test Suite: The full Mocha / Chai / Sinon.JS test suite run in a single driver page. Code Coverage: Runs the above test suite with full browser-side code coverage thanks to the awesome Blanket.js coverage library. An alternative version of the application uses MongoDB instead of localStorage for notes data and can be found in the "notes-rest" directory. The application is served via a Node.js/Express application located in "notes-rest/server.js". Although we don't provide an online demo application, the full application test suite is available online using Sinon.JS fake servers to fake out the requirement of having a real backend MongoDB server for the App.Collections.Notes tests. The test suite is nearly identical to the localStorage application tests for all of the other tests. # May need to run console as Administator for just this command. http://127.0.0.1:4321/app/: Use the MongoDB-backed application. http://127.0.0.1:4321/test/test.html: Run the tests from the live server. MONGO_ADDR: MongoDB host address (default 127.0.0.1). MONGO_PORT: MongoDB port (default 27027). ADDR: Express server host address (default 127.0.0.1). PORT: Express server port (default 4321). runs the server on port 4323 instead of 4321 (the default). The examples for each chapter are provided in the "chapters" directory, separated by number. We also provide a driver page for (nearly) all of the non-application tests. Trying out the test libraries: Some first basic unit tests using Mocha, Chai, and SinonJS. Test Failures: Different types of test failures. Test Timing: Tests that take different times, which Mocha annotates for "medium" and "slow" tests. Also has one test timeout failure. Tests: Initial simple tests for a Backbone.js application. namespace.spec.js: Verifies namespace objects are correctly setup. models/note.spec.js: Tests the application model App.Models.Note. BDD Interface: Tests using Mocha and Chai BDD styles. TDD Interface: Tests using Mocha TDD and Chai assert styles. Chai Assertions: Tests using a variety of Chai BDD assertions. chai-objects.spec.js: Object and array assertions. Mocha only: Tests using the Mocha only test modifier to run a single spec. Mocha skip: Tests using the Mocha skip test modifier to skip one or more specs. Mocha Pending Tests: A basic skeleton suite with empty specs (e.g., no test callback), which are all in "pending" state during a test run. A great test development practice is to declare specs describing behavior without functions during the initial design phanse. The specs can later be implemented in parallel with the underlying application components, ensuring that the desired behavior is correctly implemented. Tests: Continue tests for the Notes Backbone.js application. collections/notes.spec.js: Tests the collection App.Collections.Notes. views/note-view.spec.js: Tests the view App.Views.NoteView, which renders model Markdown data into HTML. Sinon.JS Spies: Various test uses for Sinon.JS spies. Tests: Tests for the Notes Backbone.js application that use Sinon.JS spies. views/note-nav.spec.js: Tests the App.Views.NoteNav view, which mediates events for the single page navigation menu bar. views/note.spec.js: Tests the App.Views.Note view, which wraps all of the other single note views and model. Sinon.JS Stubs: Tests using Sinon.JS stubs. Sinon.JS Mocks: Tests using Sinon.JS mocks. Tests: Tests for the Notes Backbone.js application with Sinon.JS stubs and mocks. views/notes-item.spec.js: Tests the App.Views.NotesItem view, which displays a table row for a single note in the "all notes" list. routers/router.spec.js: Tests an abbreviated version of the App.Routers.Router router, implementing the route matching logic, but omitting the actual view creation and display. The tests that we create a good starting point for testing routers, but please see the Notes application source for the real App.Routers.Router source and full "routers/router.spec.js" file. We don't introduce any new tests in Chapter 6, instead focusing on automating all of the application and chapter tests we have provided in this respository. See the next section for a discussion of test automation with PhantomJS. All of the tests for the Notes application and the chapter samples can be run in the PhantomJS headless WebKit engine and/or any local browsers. which will place an internal PhantomJS binary in "./node_modules/.bin/phantomjs" as well as all other necessary libraries. Karma is a multi-browser command-line test runner. It can run tests from any combination of PhantomJS and any locally installed browsers (that have a Karma test runner implemented) -- like Chrome and Firefox. This two-terminal approach saves you the overhead of firing up all of the browser environments in which to run the test suites. We run all of these tests automatically using (the awesome) Travis CI continuous integration service. Travis watches the GitHub repository containing this project and when it detects the code has changed, launches new builds and invokes the PhantomJS tests above. This instructs Travis to test out the latest Node.js versions for v0.8 and v0.10. By default, Travis already has PhantomJS installed and will run npm install and npm test on any Node.js project, which conveniently sets up and invokes all of our PhantomJS tests. Our actual ".travis.yml" file runs different commands than the default npm test to add things like style checking. But, the overall Travis configuration is essentially the same. There are many additional testing libraries and plugins specifically suited to testing Backbone.js applications beyond the core test stack we use in the application and chapter examples above. Chai has a rich plugin ecosystem, with libraries that enhance the core Chai assertion statement library, provide more specific failure messages, and make application behavior easier to express. sinon-chai: Allows Chai to make Sinon.JS assertions like expect(spy).to.have.been.calledWith(42) instead of the Sinon.JS native sinon.assert.calledWith(spy, 42). chai-jq: Adds assertions for jQuery functions and properties like $class(), $attr(), and $hidden. chai-jquery: An alternate jQuery assertion library with methods including data(), class(), id(), and hidden(). chai-backbone: Adds Backbone.js specific assertions such as expect(model).to.trigger() and expect("hash/fragment").to.route.to(). All frontend libraries used in this repository for the sample apps and chapter examples are provided in the "vendor" directory. Note that this repository has been updated since the publication of Backbone.js Testing on July 12, 2013. The enumerated versions of all third party libraries are indicated by the most current version in the repository with the published version noted in parenthesis when different. This will switch all libraries, application code, and tests to the version that directly matches the book. As of v3.x.x and higher, Mocha-PhantomJS requires PhantomJS v1.9.1 or higher. Mocha version 1.10.0 and 1.11.0 introduced incompatibilities with Mocha-PhantomJS. Modern versions of both libraries are now compatible, e.g., Mocha v1.12.0+ and Mocha-PhantomJS v3.1.0+. Backbone.js Testing shipped with Mocha v1.9.0 and Mocha-PhantomJS v2.0.3 to avoid the issue. Backbone.js is Copyright Jeremy Ashkenas and licensed under the MIT license. Underscore.js is Copyright Jeremy Ashkenas and licensed under the MIT license. Backbone.localStorage is Copyright Jerome Gravel-Niquet and licensed under the MIT license. JSON is Public Domain software created by Douglas Crockford. Sinon-Chai is Copyright Domenic Denicola and licensed under what we will politely approximate to a "public domain" license. Twitter Bootstrap is Copyright Twitter, Inc. and licensed under the Apache v2.0 license. Jasny Bootstrap is Copyright Twitter, Inc. and Jasny BV and licensed under the Apache v2.0 license. Showdown is Copyright Corey Innis and licensed under the BSD license. Blanket.js is Copyright Alex Seville and licensed under the MIT license. For those who would like to get under the hood, or help out with the application or test examples. # Run style checks for server, client, and both. # as one big test, and all of these together. # Run all style checks and headless tests. The file "README.md" is transformed from markdown into the HTML page "index.html", and can be compiled once, or watched for changes with the following commands. Note: This overwrites files in notes-rest, so don't invoke this if you intend to change those files! in addition to the tasks described above. BrowserStack: Add BrowserStack integration via Karma and Travis CI. Sauce Labs: Add Sauce Labs integration via Karma and Travis CI. Windows: Implements full Windows compatibility. Docs: Added Jasny Bootstrap for offcanvas menu. Clean up the bower library copy Grunt tasks and manually minify Underscore and Backbone now. Karma: Add Safari test driver. Libraries: Upgrade to JSON2 3d7767b6b1f3da363c625ff54e63bbf20e9e83ac, Sinon.JS v1.9.0, Chai 1.9.1, Mocha v1.18.2. Karma: Add Karma test driver support with Travis CI integration. Libraries: Upgrade to Backbone.js v1.1.2, jQuery v2.1.0, Sinon-Chai v2.5.0, Mocha v1.17.1, Underscore.js v1.6.0, Chai v1.9.0, Bootstrap v3.1.1. Libraries: Upgrade to Bootstrap v3.0.3, Backbone v1.1.0, Backbone.localStorage v1.1.7, Blanket.js v1.1.5, Chai v1.8.1, Mocha 1.15.1, Underscore.js 1.5.2. 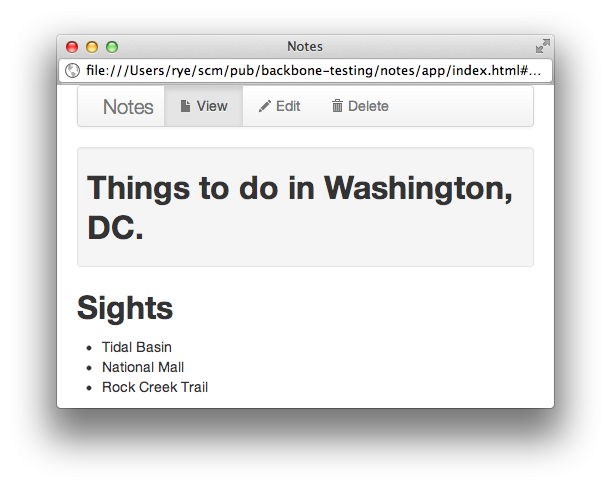 Notes Rest: Add more permissive routing and better README.md notes. Bower: Switch to Bower for all existing client-side libraries. Update all libraries to current as of 20130717.